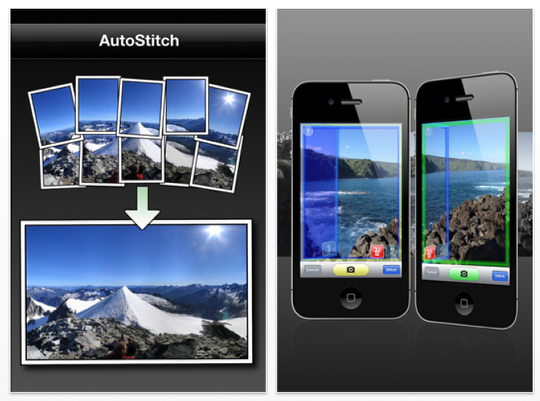 Today we are giving away the newly updated AutoStitch Panorama app v.5.0 which brings StitchGuide, a remarkable new augmented reality capability, to the popular iPhone panorama stitcher. Augmented reality is a powerful technology to superimpose visual data onto real-world scenes. AutoStitch Panorama is the first app that brings this amazing technology to the photographer, in a way that allows immediate visualization of each photograph superimposed at high resolution onto the scene in the viewfinder. As the photographer moves the camera, the previous photos remain displayed at the locations at which they were taken with precise registration and instant tracking. With StitchGuide, a photographer can take multiple photographs and accurately compose their final high-resolution panorama with a natural visualization of the placement of each image. The photographer can touch images in space to change how they are viewed or choose to delete a photo after it is snapped. To create the StitchGuide capability, Cloudburst Research developed a new technology that uses not only the iPhone gyroscope to register images, but also actively tracks image locations by matching them in real time to the scene. This prevents drift while at the same time providing instantly updated registration, producing a compelling version of augmented reality that goes beyond that found in any other apps. AutoStitch Panorama is the best pano app on iOS. It is in my wishlist. I wanna win this. Thanks for the giveaway! Not really interested in today’s app give away but wanted to thank you for the promo code for Jazz I won yesterday! I subscribed to you on dpreview.com and look forward to future updates and highly suggest others do so! Thanks for such a great website look forward to it every day. Spread the word the Appwhisperer is one of the best!! Best part of his site is Review &Tutorial. Joanne, I’d LOVE a promo for this, please?! I love The App Whisperer for ALL the AWSOME giveaways, Tutes, & interviews!! This would be a fantastic app to play around with…. Thanks for the chance! Theappwhisperer is a must-visit site daily!! Thanks for everything…. What a wonderful app that would be to have, I’ve been looking at it for a while! Can’t beat the Appwhisperer for being a quality site about all the latest news and reviews. I would be a lucky gal to win this one! Would love to see how this panoramic app works. Your site is so rich with info, it’s hard to pick a best feature. I really appreciate all the info on new and updated apps and love the tutorials section! I’ve thought about purchasing this app a number of times, as I hear good things about it. I haven’t yet because I have a number of panorama apps already. I would like this app because it would allow me to capture more of a scene both horizontally and vertically. As usual, another great giveaway. Thanks for always keeping me in the loop. You’re my go-to site for iPhoneography. My current iOS photo apps go to site. So much great new apps to check out! Dein Deutsch ist nicht schlecht. Man könnte sagen es ist besser dein mein Deutsch schreiben und ich bin Deutsch.